Angela Merkel is defeated. Not by Mr Putin, but by Jean-Claude Juncker. The new President of the European Commission was the candidate of the European People's Party (EPP) for the European Parliament Elections in May. This center block won with him. He was also supported by the German Chancellor and her CDU party which is a founding member of the EPP. 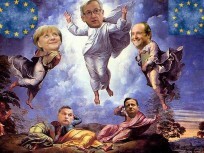 Now Juncker defeated Merkel in the composition of the important commission. Instead of pushing the German EU agenda through, which aims at clear reforms and less debt, Merkel did too little to support German former Energy Commissioner Guenther Oettinger. In the new team he will only be responsible for Digital Economy and Society - a new and minor responsibility. The only German in the commission did not even become one of seven Vice-Presidents. So EU model student Germany lost it all - while France won the trophy: a country with no real reforms, more debt and a very strong right-wing party with a degenerated political elite. Juncker dared to put the fox in charge of the henhouse in appointing the former French minister of finance Pierre Moscovici as super-commissioner for economy, finance and taxes. This socialist just failed the EU 3 percent deficit hurdle at home and criticized tax discipline a la Merkel. He just wants to continue the French way of high taxes, more public spending and no real reforms like better conditions for small businesses, less state intervention and more freedom. He is anti-Merkel and supported by French president Hollande. He is the Trojan Horse in the EU powerhouse. It is very naive to believe this Frenchman will change his roots and mindset now. The Brits got it all with Lord Hill, a former conservative lobbyist and Tory peer to oversee financial services: another fox in the henhouse who will block regulations of the banks which caused the financial shocks in 2008 with their XXL greediness. Mr Juncker acted like a grey man of the past, neglecting the future of Europe. No fresh start to reform the EU and make it competitive with the strong Chinese dragon, but mini gifts to some member states he needs for himself to rule. His team is a disillusion for those who want a strong and vital Europe with a future in a globalized world. Radical reforms are needed in most EU countries - nothing else (see Hubertus Hoffmann, Strengthening the "Soul of Europe" in Europe 3.0 through Radical Reforms). A good day for right-wing radicals, finance sharks, and the stand-still-and-rot lobbies. They all want to continue as before the euro crisis and promote just a transfer of money from the EU-workers to the EU-spenders.